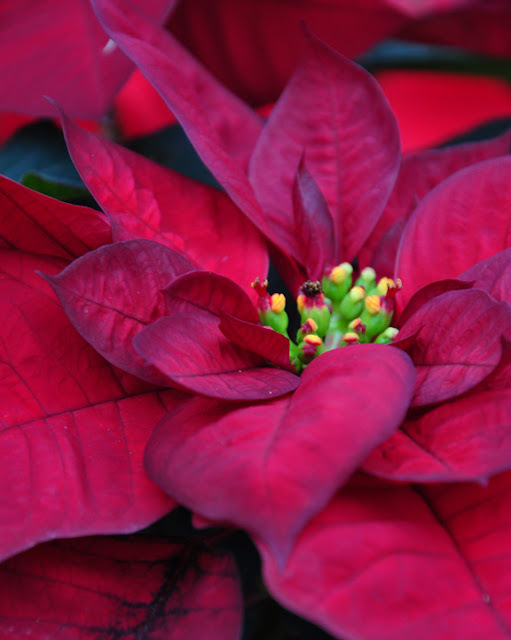 Poinsettias have come along way from their humble origins in the tropical forests of Mexico. What was once a tall, weedy looking plant has become a flower that is synonymous with the holiday season. Myself, I have never been a particular fan of the classic red poinsettia, but I doubt my views are widely shared. With sales of over $250* million, Poinsettias are one of the best-selling potted plants in the U.S. and Canada. And amazingly enough, most of these sales are generated in the short, six-week period that leads up to the Christmas holidays. Here's another interesting statistic: it is estimated that 80% of Poinsettia purchases are made by women. Is it any wonder then that many of the newer introductions have colors that are meant to appeal particularly to women: soft rose, bubble-gum-pink, purple, white, yellow and a mix of colors. To go along with the new colors are pretty sounding names like "Love U Pink" and "Winter Rose Pink". There is even a series named "Princettia". Somewhat ironically, this Christmas favourite is a tropical plant. Any Poinsettia you purchase in the coming weeks was most likely grown in a greenhouse where the temperature ranged between 60-70 degrees F. That means caring for a Poinsettia in the average home can be challenging. Getting it to re-flower can be even more so! To keep your Poinsettia healthy after the holidays, you need a warm, sunny window that mimics the warm greenhouse where it was grown. Make sure your Poinsettia doesn't touch the window pane. Cold glass will do it no favours! Another thing to avoid is placing your plant in a spot where there is the likelihood of a cold draft. Check the soil in the pot frequently to make sure it is not bone dry. When you do water your Poinsettia, make sure the soil is evenly wet. 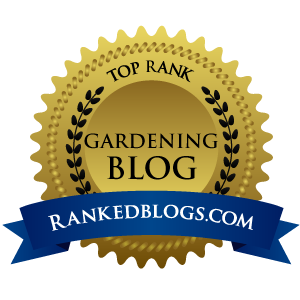 Add a water-soluble fertilizer to your watering can once or twice a month. A sign that you aren't watering your Poinsettia often enough is leaf drop. A combination of yellow leaves and leaf drop is a sign you are watering too often. Poinsettias are members of the Euphorbiaceae or Spurge family. The colorful blooms that we associate with a Poinsettia are not actually flowers, they are "bracts" which are a modified type of leaf. In February, you may notice that the flowers on the plant you purchased in December have begun to fade and new side shoots have begun to appear. 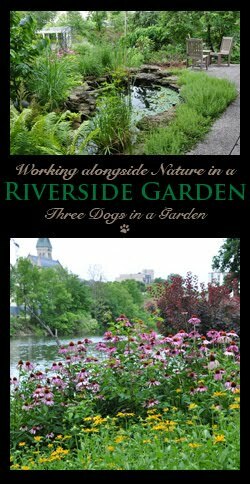 Cut back the flowering stems to about 6" leaving one of the two leaves in each stem. Sadly, this may make your plant look a bit homely for a while. New growth should appear mid-spring. Re-pot your Poinsettia as necessary. If desired, a Poinsettia can move outside once all danger of frost has passed and temperatures have warmed. Choose a location in the garden that has light shade. Keep an eye on the soil in the plant's pot to make sure it does not dry out completely. Mid-summer pinch the plant back a couple of inches to avoid leggy growth. Well before fall frost strikes, bring your Poinsettia indoors. Again, place it in a sunny window and fertilize it every other week. 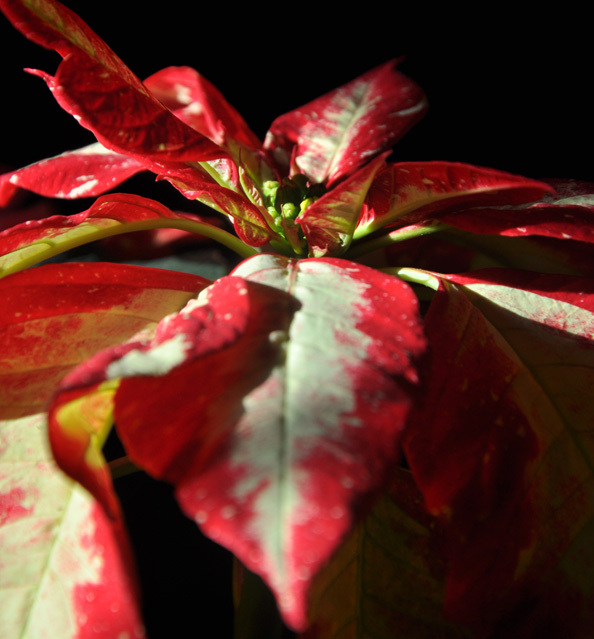 Days with shortened sunlight hours are necessary to get a Poinsettia to re-bloom. 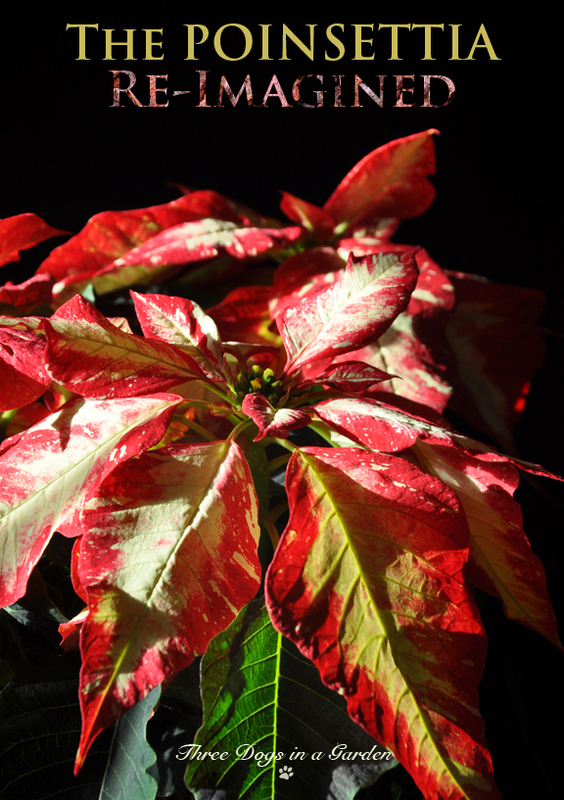 At the end of September, move your Poinsettia to a warm spot that is in total darkness from 5pm to 8 am each day. 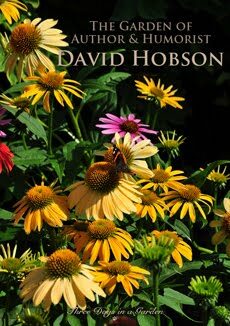 When the colorful bracts appear sometime in November, move the plant back to a sunny window. 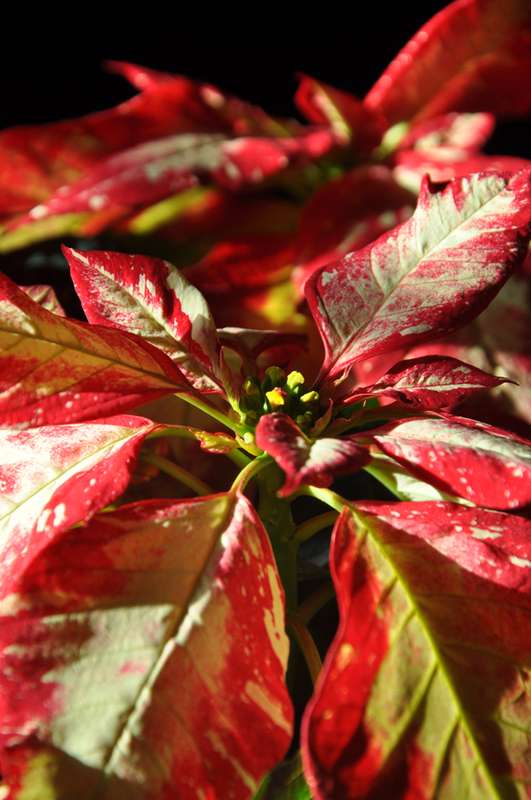 The plant that you see here is one of the new introductions Poinsettia, Euphorbia Pulcherrima 'Jingle Bell Rock'. The splashes of red on cream give it a dramatic look. 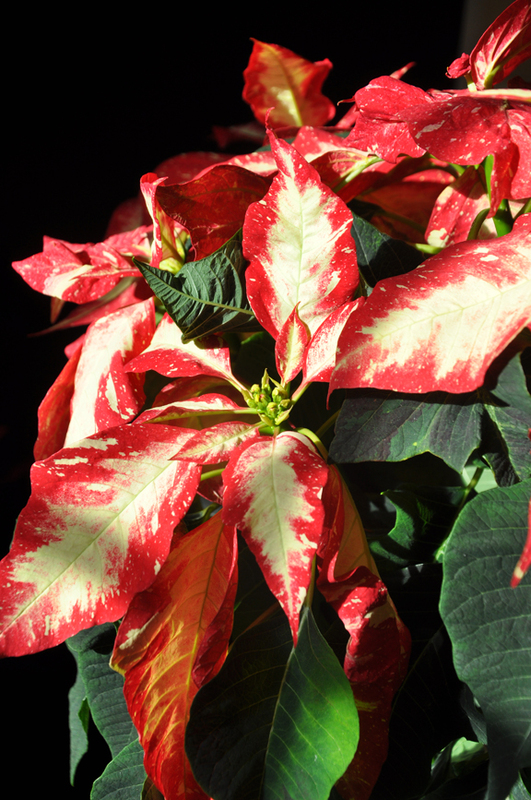 Have you had success with keeping a poinsettia happy and healthy? I know of one woman in California who has childhood memories of 10 ft plants growing in their front yard. Several gardeners have told me that their plant faithfully re-bloom...but only in summer. Lots of people find them to be great houseplants. How about you? More Information and Links: Statistics in this post are drawn from this article by the University of Illinois Extension. 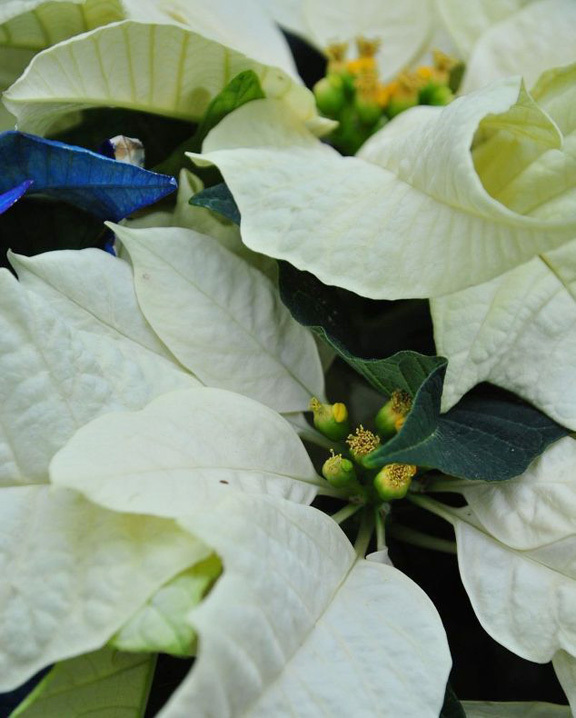 There is also information on the history and care of Poinsettia to be found by clicking the link. My poinsettias used to last forever. Then Max came along. Max loves to eat flowers... Sigh. lol! I love the variegated and lime poinsettias. So beautiful! Pets! What can you do but love them! These are some really beautiful poinsettias, Jennifer! I kind of favor the "plain old" red ones, but this year I am on the lookout for a nice white one. I wish you a wonderful Christmas, and a bright and beautiful New Year. Thank you so much for all the beautiful posts and wonderful information here, throughout the year. All the best to you too Lisa! I hope your Christmas is a merry one! I do love the red ones but I also really like the all white ones. There are shades of white so the white ones I look for are a nice winter white with green 'points' in the centre. I don't much care for the yellowish whites. My husband loves them all -- any colour. In fact, I'm surprised he hasn't purchased any this year. He's likely still waiting for me to buy the first one! I've never had luck keeping them over and re-blooming. My mother did a few times but she kept hers outside in the summer. I've seen them growing in people's yards in Texas and in Florida but they're huge! Wishing you and yours a really special, and quiet, Christmas. Thanks Diane. All the best to you as well! Thank you for this post and gorgeous pictures, Jennifer! I love all poinsettias, but those of the light lemon-yellow color are my favorite. I also admire new varieties. A lot of people seem to like those light lemon-yellow poinsettias. I hope you have a wonderful holiday too Tatyana. Merry Christmas to you too Pam!